I think these spiced mixed nuts are the perfect accompaniment to a great cocktail. That’s why I love to make them when I have company over, have a cocktail party or just to enjoy while having “cocktail hour” on the patio with my husband. These are always a hit at every party. The combination of sweet, savory and spicy really wows the pallet. 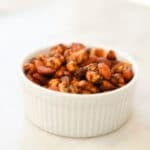 This recipe can easily be tweaked by using your favorite nuts rather than the ones I uses (which are my favs). If you make this for your friends they will most certainly love it, so you should probably make a lot! Please check out my latest YouTube video to learn some additional tips and tricks on how I make the recipe. You’ll be able to check out my husband’s amazing pan flipping skills too. Melt the butter in a saucepan over medium heat. Add the nuts and give them a couple minutes to begin toasting. When you see a bit of color on the nuts and start to smell their yumminess, add the sugar. Practice your pan flippin' skills and coat the nuts with butter and sugar. 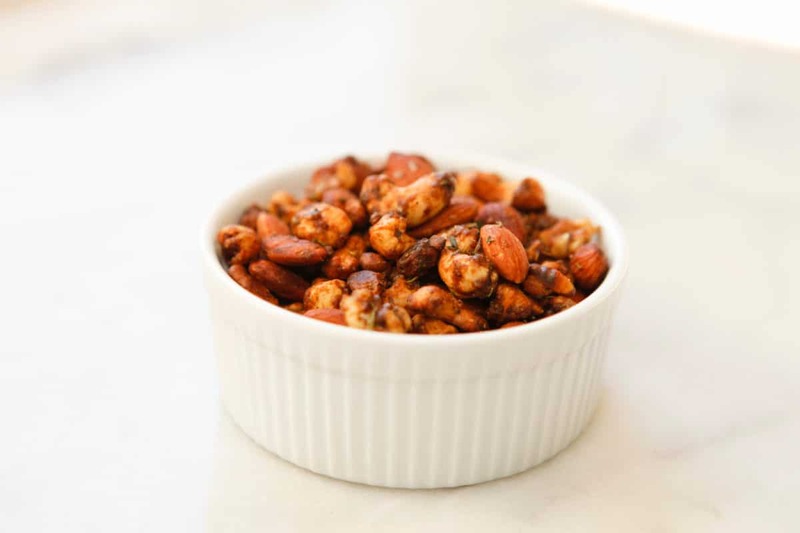 When the nuts are evenly browned, caramelized and smelling delicious, remove from heat and add the rosemary, Tobasco and sprinkle with flaky sea salt. Spread nuts in a single layer, on a plate or pan, and pop in the freezer to chill and stop the cooking. When the nuts have cooled enough to handle, break them apart to store or serve. The spiced mixed nuts can be made days or even weeks in advance, and stored in an airtight container in the freezer.